What Is Chamois And Why Does It Matter? One More Mile > What Is Chamois And Why Does It Matter? Chamois (pronounced ‘Shammy’) is the soft cushioning that sits inside your padded bib shorts. It’s crucial in providing a supportive layer for your sit bones, with moisture wicking and antibacterial technology working to prevent any irritation from sweat during a ride. Chamois comes in a variety of shapes, sizes, colours and technologies. Much like saddles, choosing the right Chamois that works for you can be a lengthy process. Some bib shorts that riders swear by can cause issues for others, so it’s definitely not a ‘one size fits all’ approach and don’t despair if you don’t get it right the first time around. The most common comparison for chamois is thickness – surely the thicker the better, right? Well, not always. Similar to saddle thickness, finding your ideal chamois thickness is a matter of personal preference. However, details like the location of seams, shape of the pad and moisture-wicking abilities play a big role in how those shorts will feel, so don’t just focus on one specific feature; it’s how the whole package works in tandem that really matters. As you start to rack up the miles in the saddle, you spend a lot of time putting bodyweight pressure on your sit bones and perineum. Combine this with the constant friction of pedalling, mix in sweat and a reduction in blood flow, then you quickly realise that your groin area needs a bit of protection! Designed to be the only layer between your rear and the saddle, Chamois is specifically created to sit in your shorts and provide support and relief to the issues above. What Features To Look Out For? Finding the perfect bib shorts can be a lengthy and painful process, especially if you’re not familiar with some of the technical terms thrown around in the product description or features. Below, we outline some of the more crucial features that should influence your buying decision. 3D fit/ergonomic fit is a feature that crops up a lot, but what does it actually mean? Well, quite simply, it’s where the chamois is designed around the contours of the human body, rather than a flat profile. It improves the way the Chamois fits around your body and improves the comfort level. Take a suit for example – a standard, off the shelf suit can be fine, but getting it tailored to your body provides a much better fit and feels much more natural, as it’s designed around your measurements. It's the same for a 3D/ergonomic fit chamois. As we’ve mentioned, one of the key factors in Chamois choice is the ability to wick away sweat and let your more sensitive areas breathe. This prevents increased irritation or chafing, one of the more common issues that ends a ride early. High end chamois products are usually perforated, which increases the performance of the material and reduces overall weight, however as it’s nearly an essential feature, most Chamois will have some level of breathability built in regardless of the budget. No matter how good the chamois is at moisture wicking, it’s inevitable that sweat will eventually build up; especially during a long, hot day in the saddle (better chamois will last longer obviously). Therefore, having an antibacterial layer is helpful to prevent any issues that may cause from bacteria build up; namely, saddle sores. Saddle sores occur when there is an opening in the skin layer, which allows nasty bacteria to delve deeper and thrive due to the warm and damp environment. Having antibacterial properties in your chamois will help to prevent this occurring. During a ride, your bike picks up vibrations from bumps and imperfections on the road, which channel through to you via your contact points on the bike. Contact points are simply, any area which you come into contact with the bike, such as your hands on the handlebar, or feet on the pedals. Vibration is a key factor in rider fatigue and increasing discomfort. By limiting the amount of stress that occurs, you’ll be able to ride longer with fewer issues. Knowing your riding style is critical here – if you spend 3 or 4 hours at a time on a ride, then finding a chamois with excellent vibration damping should be a high priority. Similarly, it doesn’t matter as much if you’re just looking for a pair to use on the turbo, then breathability becomes more important. Aren’t all Chamois the same? Not at all. Just like most products, the more you spend usually equates with an increase in quality. It’s worth identifying the particular chamois you need, and then finding which brand suits your budget and style. Most Chamois material in bib shorts are sourced from external companies, so two different brands can feel remarkably similar if they share the same chamois. At Giant, we use a variety of third party suppliers and our own brand chamois, depending on the price of the shorts. 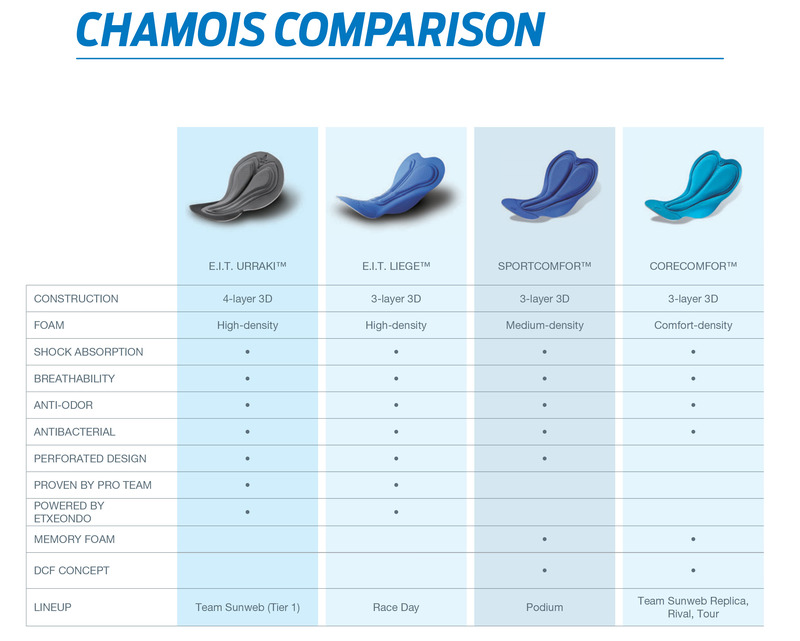 The comparison table below outlines the difference across the four different chamois’ we use. The top of the range Elevate kit uses high performance Etxeondo Urraki, exactly the same as the pros of Team Sunweb - let’s face it; they spend more time than most in the saddle, so if it works for them it’s going to be good. Packed full of technology, the key feature of the Urraki is the freedom of movement it provides, allowing the chamois to contour around your body, giving a superior fit. It also features next level vibration damping, perfect for soaking up the road as you clock in the miles. Next in the line-up, featuring on the Race Day bib shorts, is the EIT Liege Chamois. Similar to the Etxeondo chamois, however the EIT chamois is designed to be very minimalist, with an entirely smooth top layer pad, so if you prefer less padding in your shorts, then the EIT chamois is ideal. There is a central relief channel and contoured fit to increase comfort, plus all the breathability, antibacterial protection and shock absorption you need to ride as long as you want. We then move on to the SportComfor Giant brand chamois, featuring in products from our Podium shorts range. Designed with longer distance rides in mind, these chamois are designed with excellent breathability and moisture management and anti-odour properties. Finally, we move to the CoreComfor Giant brand chamois. Found in our Tour range, this chamois is ideal for shorter distance rides. 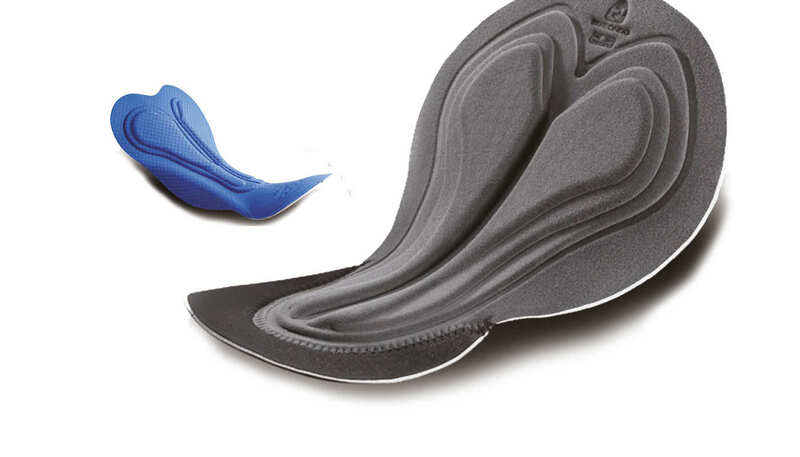 All of the Giant manufactured Chamois is designed to work in conjunction with Giant branded saddles, supporting the relief channels and padding already in place. So there you have it – all the information you need to make the right decision on your Chamois. Got any questions about cycling clothing? Why not get in touch on Facebook, Instagram or Twitter.